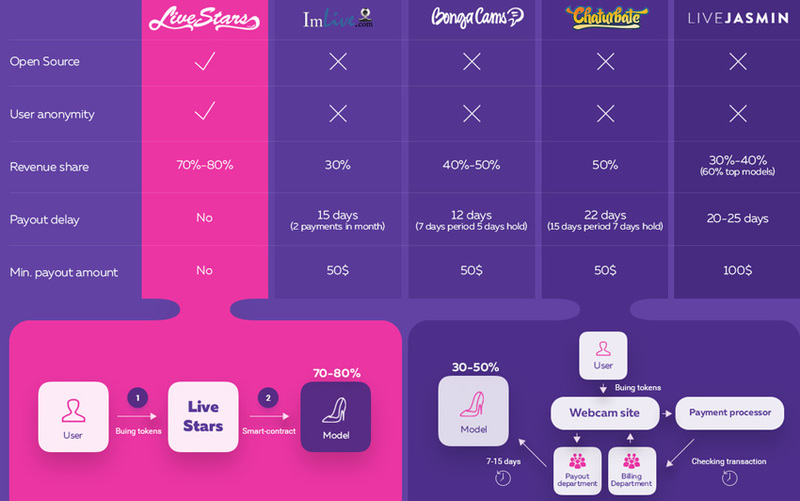 Live Stars is the world’s first webcam platform in the online adult entertainment industry that is using blockchain technology to fundamentally upgrade the system and to solve its main problems. Live Stars is a fundamentally new platform with a different business model based on the exclusion of intermediaries and automating all the processes. Implementation of the smart contracts in the business logic and financial platform segment provides a more effective, safe, and convenient interaction between users, models, affiliates, and the platform itself. Live Stars´ platform uses its own token “LIVE” as a form of the payment for services rendered. LIVE is the only form of payment. The users can buy the token on the platform using the built-in API for a quick exchange to the popular cryptocurrencies at the current rate of exchange. The token will also be available at cryptocurrency exchanges, and the users will have the opportunity to make a direct transfer to their own Live Stars wallet in their users’ accounts. The users who are not familiar with cryptocurrencies will be able to buy LIVE tokens easily for fiat money using third-party services. There will be no purchase limits on the platform. We plan to cut server maintenance expenses significantly by utilizing peer-to-peer content distribution network for public streaming. Additional work will be done in order to make our platform compatible with the modern Lovense and Ohmibod toys. These are simple adult toys which react to the amount of the tip given by the user and are very popular with the models. Private video chats and messages will be carried out through webRTC on ‘one-to-one’ principle without a server. No mediators (including administrators) will have access to private information. The LIVE token acquisition interface will be simple and intuitive, and easy to understand step-by-step video instructions will also be available. Users who are not familiar with cryptocurrencies will be given the option of exchanging to fiat money with just a few clicks. Withdrawals for the models, affiliates, and users will be possible in several popular cryptocurrencies. On the platform, the prices will be displayed in both LIVE and in USD, for the convenience of users. The platform will have an improved system of referrals, providing an opportunity to earn not only for the models, but also for the users. Current websites include a single-tier referral program. Thanks to the blockchain’s reliability and our automated system, we created a multi-tiered referral program for all the people involved without any glitches or time limitations. While working on the study, we performed an additional survey among models and users. The models were asked to specify some of the aspects of the current webcam sites they were not content with. High commissions, long waits for payments, doubts about confidentiality and the security of their personal data was mentioned. The users who were presented with similar questions stated their disappointment by the fact that the majority of their payments goes to the platform’s owners, not the models. They are also concerned about their anonymity and security. They also experience delays when making purchases and bad service. Our project team took the participants’ wishes and growing demand into account, while also achieving cuts in expenses by automating business processes and getting rid of unnecessary departments. The LIVE token will be the only possible form of payment on the Live Stars platform. Token emission is limited. 70% of the tokens will be in the hands of investors, while the remaining tokens that are unsold during the crowdsale will be burned. We are sure that the integration of the latest technological solutions and Live Star’s open-book policy will soon become a great advantage in marketing campaigns and will allow the project to take a leading position in webcam industry.